Here is the full list of top 10 bestselling movies on Apple iTunes store that you can't miss in the year of 2017. 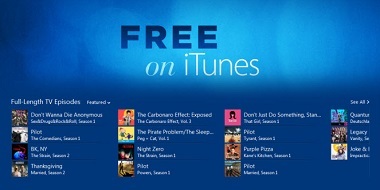 There are many free episodes available in iTunes. Here you can find out the top 10 free iTunes TV shows of 2017. With 2019 Oscar ceremony is approaching, the nominees have been announced on Jan 22th, 2019. You can check this page to find out the full list as well as other useful tips. Are you interested in the bestselling book The Hate You Give? If so, you can read this review to find the tips to download the audiobook and movie. Want to learn what happened in the past Hollywood Film Awards 2018? Here we have got you covered with anything you will be interested to know. A Star Is Born 2018 is a great remake of the original musical drama. If you like it, you can learn more from this review and find the tips to download the movie and soundtrack album. If you miss the live streaming of the NFL Super Bowl game or playoffs, you can now rent them from iTunes at a low price. Also, you can use a DRM removal tool to get rid of the 48 hours limitation. Cannes Film Festival is a great platform for awarding the talented video professionals and the fantastic movies every year in the world, check this article to learn more about the 2018 71st Cannes Awards. Want to watch Ready Player One soon? Why not read the detailed review of Ready Player One before viewing it? After that, you can get more from this sci-fi movie. Three Billboards Outside Ebbing, Missouri is a tragicomedy about a mother who fight for the murder of her daughter. Though the anger, violence, humor etc. it let's think more about humanity. The Shape of Water is telling the new story of "Beauty and the Beast," you can read on this review to find out more detailed info, such as release date, cast, plot and more. If you are interested in the awards list of 68th Berlinale, you can read on this article to find out the complete winners list of the 2018 Berlin International Film Festival. The 2018 Oscar nominations have just been announced on Tuesday at the Samuel Goldwyn Theater in Beverly Hills, check this post to find the complete nominee list and the winner predictions of 90th Academy Awards. Guardians of the Galaxy Vol.2 continues to tell a funny, touching story about Galaxy adventure, you can check this movie review to find the details such as the plot, Easter eggs and so on. The 75th Golden Globes awards honored the best movies and TV episodes of 2017, you can check this page to find out the complete list of the Golden Globe Winners of 2018 and find out the solution to stream the videos if you haven't watched them yet. Blade Runner 2049 is the best sequel to the original classic Sci-Fi movie with faithful and profound plots, it will surely remind us of the classic and bring us with deeper thinking about human, check this movie review to find out the details. Here is the list of the top-rated 8 best Christmas TV shows for family. You can check out this article to choose the most anticipated TV shows to watch on Christmas. Apple has just unveiled the top 50 TV series recently, we pick the top 15 from the list to review in this article, you can take a look at it to learn more about the hottest TV shows of 2017. Looking for something great to watch? There is a hot review on the top 8 best and most popular iTunes movies in 2017 while introducing the best solution on playing iTunes DRM movies on non-Apple devices. Christmas is coming soon. In this article, you can find out the top 8 best classic Christmas movies to watch on Christmas Day while introducing some tricks on watching Christmas movies on smart TV. Have you planed the movies to watch with your kids this Christmas season yet? To get more holiday cheer, you can check our top the list of best Christmas family movies. In this hot review, you can get a full knowledge about Game of Thrones and you will find out the best online store to purchase Game of Thrones for watching on your devices.